After spending a few weeks reviewing the Lawson Blue Ridge Camping Hammock I felt a little like the food critic Anton Ego from the Disney®/Pixar® animated film Ratatouille when he flip-flopped on his critique of Gusteau’s restaurant. Perhaps I can appreciate his predicament as he faced standing up for something he had dismissed before. In my case, it is defending the case for the spreader bar hammock. Perhaps a caveat and a clear definition are appropriate to insert at this point. 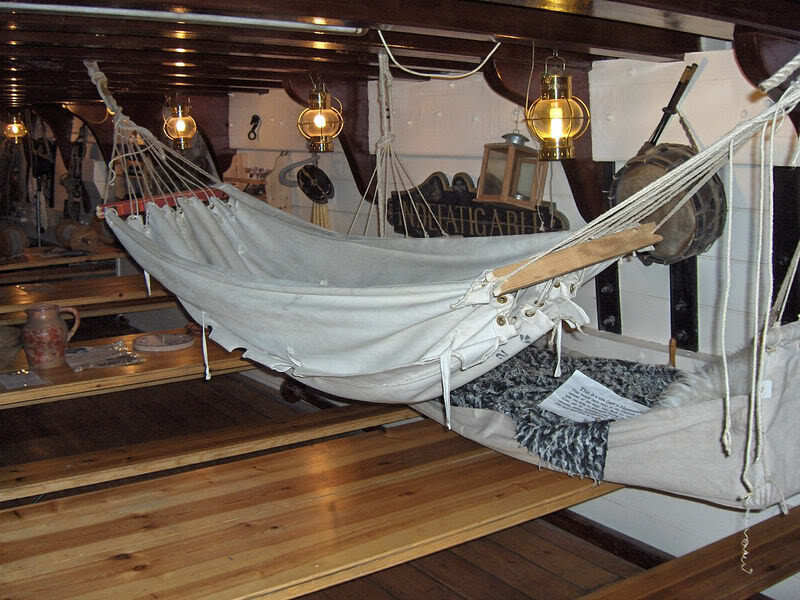 Generally speaking, the term “spreader bar hammock” refers to the relatively “new” back yard American-style hammock that uses thick cotton rope, loose weaving, and wooden spreader bars. To be clear, nearly any hammock pitched tight suffers from a high center of gravity and can be tippy. Spreader bars contribute to, but are not solely responsible for, tippiness. In fact, traditional Nicaraguan hammocks are often constructed with spreader bars on the end and don’t suffer from being tippy. Folks have also discovered that adding mini spreader bars on a Brazilian-style hammock has the effect of artificially lengthening the hammock, eliminating calf ridge discomfort, and providing a wider bed for a diagonal lay. The trick is to pitch a hammock, with or without a spreader bar, with an appropriate sag. That sag differs based on the size of the hammock, but by simply dropping the center point down, the tippy nature is nearly eliminated. (For help achieving an appropriate sag, check out my Hammock Hang Calculator.) The deep sag also allows the occupant to sleep diagonally across the center point, allowing for a flatter lay. I continue to affirm my position that the modern spreader bar hammock with the tight pitch, wide spreader bars, and woven rope design is inherently tippy and uncomfortable for long-term sleeping, for reasons beyond just the spreader bar. But we’re not talking about that type of hammock. On the surface, the Lawson Blue Ridge Camping Hammock appears structurally similar to a modern woven spreader bar hammock. Yes, the Lawson uses spreader bars, but the similarity stops there. First, the spreader bars on a Lawson are short—they do not extend the entire width of the hammock body. This is an important distinction because it plays into the way the fabric interacts with the bar, the tautness of the fabric, and the lay. The fabric at the end of the hammock is also gathered and pleated, creating a pocket that helps lower the center of gravity further. In addition, the Lawson doesn’t suffer from the sometime extreme tippiness from modern rope hammocks. What really spreads the fabric apart in the Lawson isn’t the bars, it is the tent poles used to open up the bug netting. The poles have some flexibility, so there is some “play” in the lay of the hammock. I literally took the Lawson apart and rebuilt it numerous times, and worked with different hang angles and other options. What I found is when the Lawson is hung with a typical 20 to 30-degree angle on the suspension lines, it acts much like any Brazilian-style hammock in terms of overall lay, comfort, and stability. When empty, the Lawson hammock appears to hang with a tight pitch, but appearances are deceptive. The spreader bars on the Lawson achieve what some are finding with mini spreader bars on gathered-end hammocks: the elimination of bunched up fabric that can cause a ridge running under your legs, contributing to calf strain and hyperextension. The Lawson hammock can be a little tippy based on how you pitch it, but overall I find it a viable competitor in the all-in-one camping hammock category. MANUFACTURER RECOMMENDATIONS It will accommodate individuals up to 6 ft 3 in (191 cm) tall and up to 250 lbs (113 kg). Weight Hammock kit: 1,905 g. Hammock: 653 gTent Pole: 110 g ea.Nettles/Clew: 118 g ea. Spreader Bar: 311 g ea. The Lawson hammock uses rope clews to connect the hammock to the anchor point. The ropes are threaded through the spreader bars and then tied to the hammock through metal grommets. Having spent some time reverse engineering hammock clews, I knew my way around tying and reconstructing the clews. The model I received didn’t have any metal hardware on the clews, only a rope loop (some earlier models used steel rings). While serviceable, the rope loop wasn’t my preferred attachment point. The loop can be removed and replaced with a climbing-rated carabiner or a lightweight aluminum descender ring that can make it easier to attach longer straps, Whoopie slings, or other suspension systems. The Lawson hammock is one of only a few all-in-one camping hammocks that comes complete with everything you need for a shelter, and it also happens to be the least expensive. Having a tarp as part of the kit is a big bonus for those looking for a simple set-up and don’t want to bother with the a-la-carte method. The tarp is designed to “wrap” around the hammock. The corners of the tarp clip to the hammock body where the tent poles attach, by means of small shock cord loops. There are also patches of hook-and-loop patches that allow the tarp to grab onto the hammock. 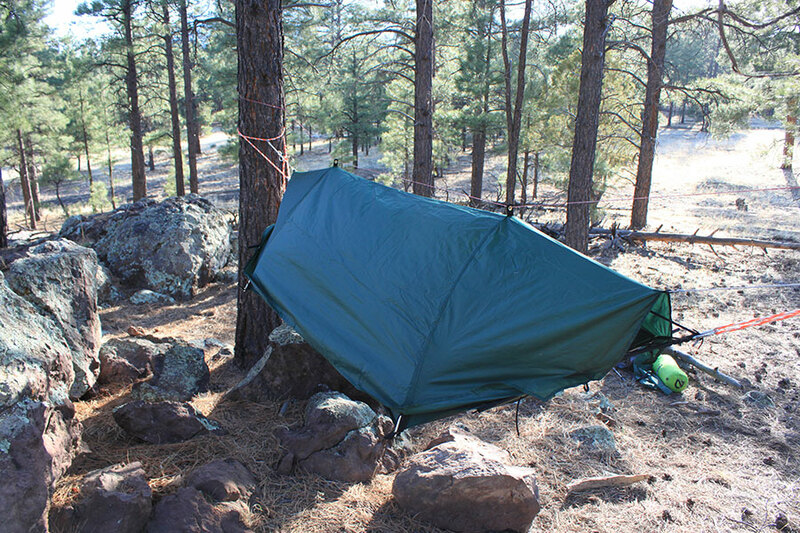 By wrapping around the hammock, the tarp is designed so you don’t have to guy out the corners, but guying is possible and recommended for a tighter pitch. I found that the hook-and-loop attachment on the tarp wasn’t very effective and came detached once I got into the hammock. Further, the hook-and-loop is nearly impossible to secure once the bug net is zippered closed when I’m inside. 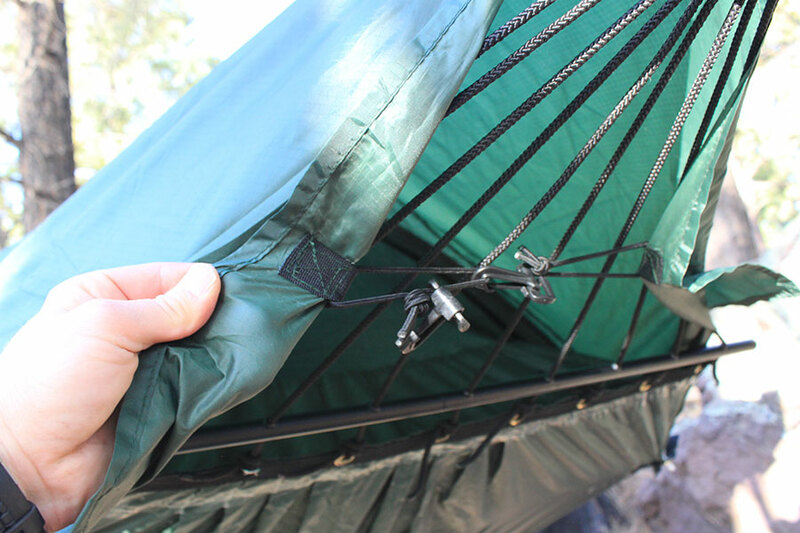 The ends of the tarp wrap around the hammock clews with some plastic hardware and shock cord. The hardware is mismatched for its use. I would recommend swapping a simple mitten hook instead of the strap clip that comes with the hammock. As you can see from the photo, I only used one clip to secure the tarp; the extra hardware can be safely removed. One of the things I really loved about the Lawson was the roomy interior, made possible thanks to the tent poles. For the price, I would have expected fiberglass poles, but the Lawson uses quality aluminum tent poles instead. The tent poles pull apart in odd places (to my mind) creating several pole pieces, but it they still function well. The shock cord running through the poles keeps the poles together and makes assembly and packing easy. 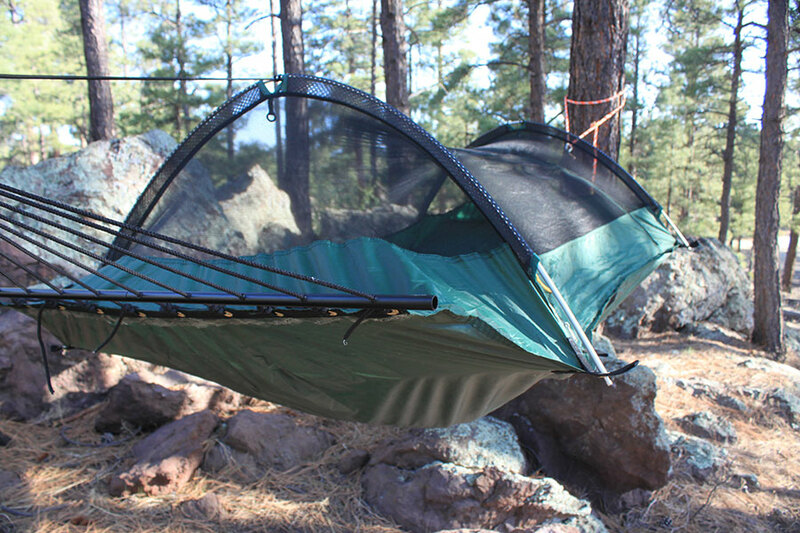 The bug net, and hammock, is accessible from a single zippered entry on one side. It is important to remember to let the “door” hang out of the hammock when entering so you don’t end up laying on it, or adding stress to the seams and pulling on the door while getting in. The body of the hammock has a waterproof coating on the exterior to enable the hammock to be pitched on the ground. The Lawson also features bathtub-style “floor” with taped seams for weather protection. I mentioned that the ends of the hammock are slightly gathered and pleated, creating a pocket, of sorts, that lowers the center of gravity slightly. The polyester fabric is a personal favorite as it has less stretch than nylon so I get a firmer lay while still benefiting from an ergonomic lay. 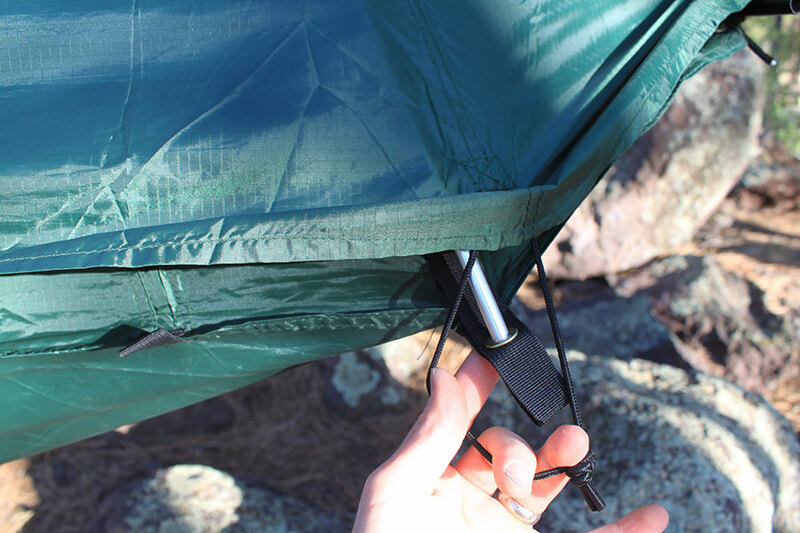 The tarp uses short shock cord loops to connect around the tent poles. This is also where I attached my under quilt. Under quilts work great with the Lawson hammock. Thanks to the four pole attachments, it’s easy to connect an under quilt, and because the fabric is pulled out, there are no air gaps to worry about. To use my under quilts, I had to loosen the gathered ends so the quilt lay flat, and then I looped the shock cord around the pole connection points. Sleeping pads also work fine with the Lawson hammock. Again, because the fabric is pulled flat, the pads don’t curl up as they do with gathered end hammocks. The Lawson Blue Ridge Camping Hammock is a very affordable all-in-one camping hammock for base camping and selective backpacking trips. Because of the additional weight from the spreader bars and tent poles, the hammock is not the lightest option available, but it is comparable to many single-occupant tent shelters. Roomy interior, thanks to the vaulting tent poles. No leg strain or hyperextension. Very comfortable lay. 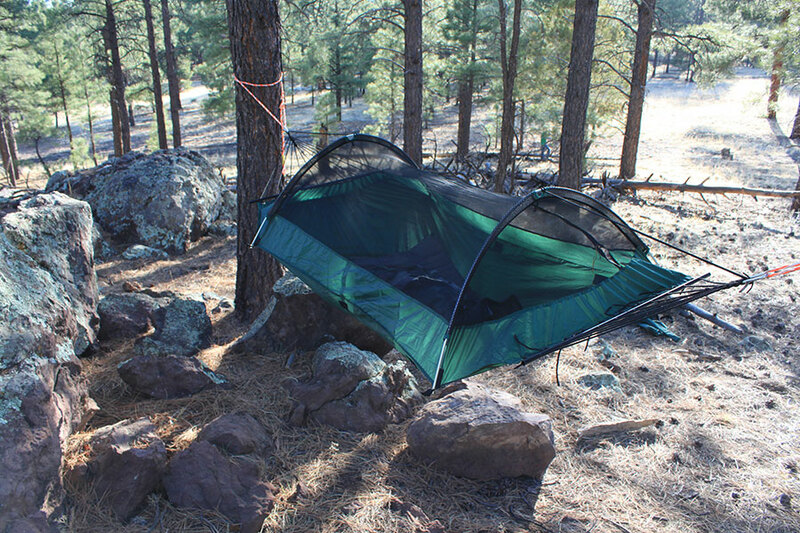 All-in-one kit includes hammock, bug net, and tarp at a very reasonable price. The spreader bars and tent poles put it on the heavy side (1.7 kg/3.8 lbs). The hook-and-loop attachment for the tarp is less effective. Pitch the suspension at a 30-degree angle before attaching the spreader bars. Pitch the foot end slightly higher than the head end to keep from sliding. Add guy lines to the tarp corners for a secure storm-weather pitch. If you are concerned about tipping, use tie-outs to hold the corners. I recommend the Jacks “R” Better Self-Tensioning Lines. To eliminate weight, remove the spreader bars and tent poles. If bugs aren’t a problem, you can remove the tent poles and lay on the hammock or flip it upside down. Disclosure of material connection: The author (Derek Hansen) was provided with a free sample from the manufacturer for testing and evaluation purposes. I have the Lawson that was made for the Boy Scouts. I think what really changes the sag of the hammock is that my tree straps are used with cambuckles and I tighten them full. When I sleep in the hammock there is very little sag. I do not remember a time that I even came near to tipping. I even used it on the troops 50 mile paddle down the Suwannee River. The temps outside at night were below 30 and with the fly on, I was very warm with only a small pad. I am mixed between the Lawson and sleeping in my ENO Double nest. The disadvantage of the Lawson is the daytime chill time. It is not as easy to “jump” in the hammock in the afternoon for a bit of down time. I’m glad I got a chance to really test out the Lawson because there was a lot of opinions floating out there about it being tippy. I was surprised myself when I found it wasn’t as bad as some reports. But, I will say that in my own experience it is dependent on how it is hung and how you lay in it. Adding some tie-outs on the corners is a fail-safe way to ensure it doesn’t tip. It really does have a nice lay without the worry of calf pressure points. So, how does this compare for you to other common bridge hammocks, like the Warbonnet RidgeRunner or JRB BMB? Well, they don’t compare at all because the Lawson isn’t a bridge hammock. 🙂 I’ve got a post in queue that compares the three bridge hammocks on the market, so keep an eye out for that. Bridge hammocks have spreader bars, but the center of the hammock isn’t attached to spreader bar at all and sags in the middle. I do not understand your last reply. You state that the Lawson isn’t a bridge hammock since it somehow is attached to the spreader bars at the center and therefor will supposedly not sag. I have searched the Lawson website, Youtube, and your site to find a video or even a picture of someone actually laying in the Lawson hammock and I find nothing. Where and how is the Lawson hammock attached in the center to the spreader bars? I see no such thing. I do not see how it will not sag in the middle when subjected to a load. Maybe only a small sag but not much different than any other bridge hammock, or gathered hammock. Derek, Ed here. I found some video’s on youtube where people are actually laying in the Lawson hammock, sorry for the mistake on my part. The hammock does sag but very little. I still do not see how this hammock is different than what you describe as a bridge hammock. I have looked at the video’s on the Grizzbridge, Warbonnet, and JRB and don’t see where the spreader bars and this system are different. This is just more or less a suspension bridge rather than a spanner bridge. The Lawson is not a bridge hammock. Bridge hammocks are more like barrels or canoes, and the poles keep the head and foot end from collapsing together. The rest of the fabric at the head and foot ends are not suspended. Only the side rails or gunwales are tied out. Imagine doing that on a generic gathered end hammock, except instead of gathering up or tying up the entire end, only tie off the corners and let the middle sag. This is a crude description if how a bridge hammock is constructed. The Lawson is a gathered end hammock that uses a shortened (no full length) spreader bar and tent poles that help to spread out the fabric. It is not constructed to work like a bridge hammock, nor does it lay like one. The Lawson is constructed like a traditional American spreader bar hammock using grommets and nettles to gather up the fabric on both ends. 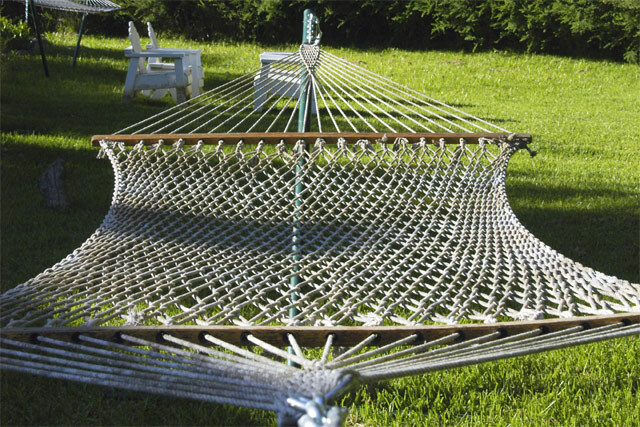 The pleated fabric on the ends does not create pockets for either the head or foot ends as the slack is taken up by center mass in the center of the hammock. Howdy Derek. Wes mentioned you when he and i were talking a week or so ago. He also sent me a hammock to review. iI am in it now, actually. Had to laugh when i read your first few lines, as i have have mixed feelings about testing a Lawson. Having made a few non-spreader bar hammocks that i love, i sort of expected to hate the Lawson. i have only been in it for maybe an hour so far, but am actually liking it. What size underquilt did you use? What do you recommend for underquilts to be used with this hammock? Thanks for the review, very instructive. Any under quilt will work. Since the Lawson uses spreader bars, it helps seal up the quilt better. So far I LOVE MINE!!! But under quilts are too pricy ($100-$300)…! Blue Ridge Hammock + Reflectix = one toasty warm camper!!! How did you attach the reflectix to the hammock? Inside or underneath? I would think it would move and bunch if inside. I have really struggled with comfort in my Lawson, but am not giving up on it! •Sleep at an angle and not along the Ridgeline…. •Reflectix underneath your sleeping pad (Thermarest or whatever)… Inside the Hammock. Once you sleep at an angle and have a good quality pad and sleeping bag and the reflectix you will be super comfy! The Lawson site says that the hammock can also be used as a tent, has anyone tried this? Just thinking it would be handy for those times when there are no trees around. Yes! It works. Any hammock can be used on the ground as a bivy, particularly if the hammock has a sewn-in bug net. The Lawson makes it easier with the tent poles. I’d recommend bringing a short piece of Tyvek or other ground sheet to protect the hammock body from abrasion. Derek this is an amazing review, thanks for taking the time to do this. All the pictures are incredible! I have recently this hammock after reading your review. After I have conducted my planned mods to get rid of the niggles I think I will be quite happy with it, especially as you say “for the price tag” but I have to ask about the weight of your hammock. My kit as shipped comes in at 2.2 kg!!! what did you have to remove to get yours to 1.7 kg, or have Lawson recently changed the material they use. It will now be used for glamor hangs only and I have to think about a practical alternative for multi-day trips. Did you weigh the individual components and see how they compare with my weights? It looks like I also separated the rain fly, which adds some weight to the entire kit. You can make up some small weight savings by eliminating unneeded clips and accessories. Major weight savings can be had by upgrading the clews and using Dymeema cordage (Amsteel). You can also eliminate the tent poles if you want to go even lighter, using string to pull up the bug netting. While this won’t feel as roomy, it will be serviceable. The whole kit is about 4 lbs stock. If you are looking for a lighter hammock kit for a good price, you might consider the DD Hammock line. The Lawson has advantages in some areas over other hammocks, which justifies the weight for some people, but I understand the need to go light, particularly for multi-day trips. Send me an email and we can talk about other options that might better fit your needs. Thank you for your reviews/comments. I am new to this and looking for a hammock for two that I can use in the English weather. Is this a good option? Any other suggestions? There are actually very few two-person hammocks on the market. The reason is that even if a single hammock can hold the weight of two individuals, they would both eventually sink into the middle and squash each other. Unless you like that sort of cuddling, it isn’t recommended. The multi-person hammocks on the market solve this by attaching two or more hammocks together. This is true of the Clark Vertex Hammock and the Tentsile Stingray hammock. The simplest way to use hammocks as a couple or with a team is to use individual hammocks and then pitch them side-by-side or in a “V” formation and share a tarp. The benefits of this arrangement include 1) getting a hammock that fits you and that meets your needs, 2) not being disturbed when your partner moves, 3) more flexibility in setting up camp with less limitations on finding perfect anchor points, and 4) having a solo shelter if/when you need it. For English weather, regardless of which hammock you choose, pick up a larger tarp, possibly a winter style with doors. Hey man, I just purchased a Lawson. Do you think I can use the ENO Atlas straps for suspension. Any input would be great. Thanks man! I own a LBRCH and have only used Atlas straps. Work great. Enjoy! Derek I am trying to get my mount Washington 4 JRB to fit on the Lawson. Not sure how to rig it any help would be appreciated. I’ll have to double check the specifics on that quilt, but generally what I do on the Lawson is loosen the ends on the under quilt and wrap the elastic suspension loops over the spreader bars. This pulls the quilt fairly flat against the bottom of the hammock. Thanks for the info, that’s what I did I’ll just keep messing with it to get it right. Awesome! That’s one thing I like about the Lawson: the ability to adjust the clews. Hello Derek, thanks for all the hard work that you do on reviews. What an awesome resource! I have sore shoulders that make shoulder squeeze unbearable. I was wondering which hammock the Lawson or the Warbonnet would give less shoulder squeeze? Also how wide of an inflatable pad can you put in the Lawson? Thanks Derek. Are you talking about a bridge hammock? They typically have more, not less shoulder squeeze than regular hammocks. If you get the right sized hammock and set it up right, shoulder squeeze is minimal. The Lawson is a good choice because of the spreader bar a pad will also help. Oh, for width you can use any commercial camping pad. Lots of room. I have a Lawson Hammock that I use on canoe trips, so weight is not that big of a factor, but I would like to possibly use it backpacking also. It is a bit on the heavy side. I saw online where a guy replaced the steel spreader bars with carbon fiber tubes and cut quite a bit of weight. I have some old aluminum tent poles that are about the same diameter as the steel tubes. Do you think they would be strong enough? Can you send me a link of that mod or where it was mentioned? I suppose if you carefully drilled the holes it might work if you pass the nettles through, like the steel version. Even replace the ropes with some lighter / stronger Amsteel will work (I’ve done that). This is the link. I may try something like this, but I question the strength of those aluminum rings that he used.